Dr. Weiss’s presentation focused on how the proposed Sargent Quarry would adversely impact iconic species such as the American badger, puma and California red-legged frog. 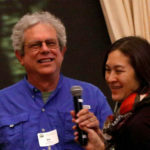 Weiss emphasized the vital importance of the Juristac area as a landscape linkage for maintaining the genetic diversity of wildlife in the Santa Cruz Mountains. What follows is a partial transcript of his presentation. The accompanying video contains his full talk. 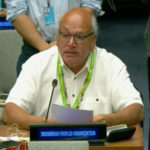 "I want you to ask this question: is putting a large industrial complex in a critical wildlife landscape linkage something we really want to do?" “…What I’m going to talk about are the natural resources on Juristac, Sargent Ranch. It’s a really, really important piece of land for the entire Bay Area. “…Something that really is an issue on this site are the wildlife implications of putting in the quarry. Our top predator is the puma—the mountain lion. And the puma population in the Santa Cruz Mountains is really at high risk, because of small population size. It may turn out that the Santa Cruz Mountains are the best puma habitat in the world—supporting the highest density of pumas—because it’s really high productive, a lot of deer, etc. It’s just, the range is not large enough to have a genetically viable population. 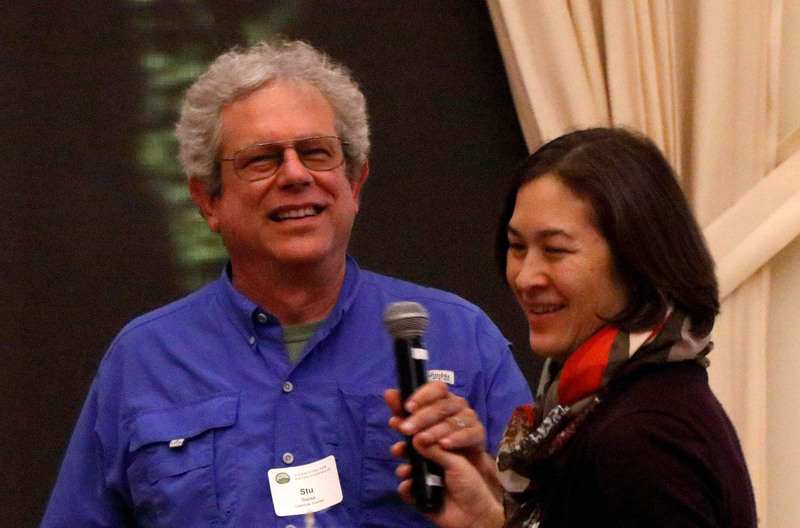 “…Another species that’s really at risk in the Santa Cruz Mountains is our friend, the badger. Badgers are really cool animals. It’s an isolated population in the Santa Cruz Mountains, just like the puma, or maybe even more so. It’s at risk from small population size. There’s just not enough badger habitat to support a genetically viable population. So, again, we have inbreeding, and [the need for] immigration. 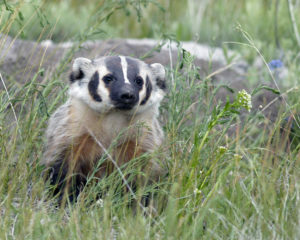 And, you know, badgers are like the most badass animals out there, they’re a big nasty weasel. If you’ve ever encountered one, you know, they’ll snarl at you and stuff. And unfortunately, they try to do that to 18-wheelers coming down 101 when they’re trying to get across. That’s not a fair fight. “…So the point is, maintaining this connectivity to the rest of the world is absolutely essential for these wildlife populations in the Santa Cruz Mountains. There have been numerous studies on landscape and wildlife linkages, statewide and locally. And it just turns out that Sargent Ranch right here just shows up in every study that’s ever been done in California, as a really critical wildlife linkage. It’s well documented in the Santa Clara Valley Habitat Plan, the Bay Area Critical Linkages project, etc…Here’s another map. There’s Sargent Ranch, you can see the arrows going in all different directions. It is probably one of the single most important wildlife linkages in Northern California. 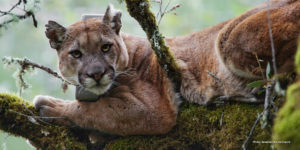 Basically, the health of certain species of wildlife—the puma, the badger in particular, in the Santa Cruz Mountains—is absolutely dependent on animals being able to get into the Santa Cruz Mountains from the wide open spaces of the Diablo Range, and the wide open spaces of the Gabilan Range. So, when we look at the bigger picture, there’s really only two semi-intact linkages between the Diablo Range and the Santa Cruz Mountains. We have Coyote Valley, which has been the subject of long pitched battles led by a lot of people including the Committee for Green Foothills. There’s an amazing Coyote Valley landscape linkage study that just came out in the past few years, sponsored by the Santa Clara Valley Open Space Authority. And then we have the Pajaro, down here in Juristac. And there’s really only one [linkage] to the Gabilan Range, across the Chittenden Gap where the Pajaro River cuts through the mountains, and that’s Juristac. So, I want you to kind of ask this question: is putting a large industrial complex in a critical wildlife landscape linkage something we really want to do? It’s already extremely tenuous as it is, and the level of disturbance and the development footprint [of the proposed quarry] is only going to make this area a lot worse for wildlife passage. “…The Sargent Creek watershed itself is the area most severely impacted by the proposed quarry. It’s about 1,269 acres, and flows directly into the lower Pajaro. The Sargent Creek watershed, by a rough estimate, provides hundreds of acre feet of groundwater recharge and runoff. That recharge provides summer baseflow in Sargent Creek. That recharge is going to get lost with 100-foot pits in the watershed. So I think it’s pretty clear to say that this quarry would mean the end of any kind of integrity for this particular watershed. Now, it’s just one little watershed. But there’s something really special in the Sargent Creek watershed. Turns out Sargent Creek supports our friend, the California red-legged frog—which is listed as a threatened species, so it has legal protection. [The Sargent Creek population] is actually kind of unusual in the big scheme of things because they’re stream-dwelling and stream-breeding. 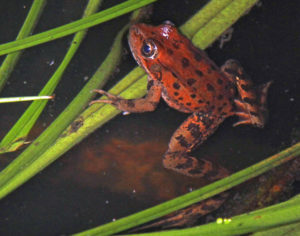 Most red-legged frogs now are restricted to stock ponds out in the range lands. They used to be incredibly abundant in the valley bottoms, where we had extensive wetlands complexes, and lots of vernal pools. Now, they’re kind of relegated to these little patches of the uplands that are largely being maintained by the ranching [management]. So, having a natural stream dwelling population of California red-legged frogs is actually a pretty precious thing out there. “…All of these issues are going to get aired with the environmental impact report (EIR). And one thing I can assure you is that the consultants who are preparing that EIR for the quarry are going to try to paper over a lot of the irreversible impacts to things like the California red-legged frog, to the wildlife linkages. So, we have a chance to really weigh in for our wildlife and our resources. A good model for this is what happened when they had the Coyote Valley specific plan back in about 2005. People weighed in and the EIR sunk under the weight of over 1,000 substantive comments. [appluase] Of course, the economic crash had a little something to do with it. But, the power of people to weigh in under our environmental laws—this is our chance. To view the entirety of Stuart Weiss’s presentation and the accompanying Q&A session, watch this video. Weiss touches on other topics including tar springs, serpentine grasslands, and steelhead trout.